The four nights of performing in Atomic Vaudeville's "Cute Attack" are now complete. This was one of my favourite episodes to be in, and what a whirlwind it was! I came down with Salmanella poisoning the first week of it, and didn't realise what I had, and performed a show in that strange state. On a better note, I got better! The show was such a hit, and so much fun. I played my accordion in two acts, felt great to play infront such a large sea of people on closing night. The place was packed wall-to-wall, and what a powerful feeling of having 150+ eyes watching you. My Mother got some pretty good footage of our dance off and of the "Lion and Lamb" skit which I played in. All available to watch on youtube. 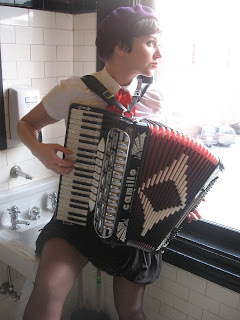 Highlight of my night was having a very lovely female audience member come chat with me afterwards telling me she saw me play at the December 07 Accordion Club meeting. I mentioned at the meeting I was in Atomic Vaudeville, and because of that she has been coming out to the shows.